MPA News Northland will bring you news and information about marine protection and management around Northland. This is a community engagement project initiated by the Department of Conservation Conservancy marine team. Northland community based groups, hapu and Iwi and government agencies are welcome to contact us about participation in this project. Here two links to the just released WWF Colmar Brunton report on marine conservation in NZ. Vital reading on 'where we are in NZ'. A must read for anyone interested in the future of the Ocean. Find out more about what's happening in Seaweek and win fantastic prizes by listening to MORE FM from 28 February - 4 March. And loads more for all the family! Offering around Northland - promotion during Seaweek (26 Feb-6 March) for delivery to teachers after March 6. Professional development and new teaching opportunity for teachers and schools interested in marine education. New teaching resources and material based around the popular End of the Line movie released in NZ during Seaweek 2010. If you are interested in participating, please contact Julie Holt direct. Dates, times and locations will be confirmed. Cost: To be advised/confirmed, depending on numbers and location. Fancy a road trip? Come and explore the wonders of the marine reserve at Goat Island for Seaweek's Community Snorkel Day on February 27. Free guided snorkeling session for all the family! The hugely popular annual summer (Seaweek!) watersports day for Ngunguru school students and their families. A wide range of activities are on offer, including water safety and education. The school is in an idyllic location on the edge of the landmark Ngunguru estuary. Contact the school office for information. One full day of fun with events, challenges, activities and workshops for children from 16 schools throughout the Whangarei District. Numbers limited and booking is required. Children need to bring a packed lunch, sun hat etc. Admission by prior arrangement only. Casual visitors cannot be accommodated. Dr Roger Grace is a well-known marine biologist and professional photographer, and has been an active campaigner for marine conservation, both in New Zealand and internationally. He has played a role in many of New Zealand's marine reserve campaigns and is a frequent contributor of articles on marine conservation to popular marine magazines. Dr Grace is currently involved as a supporter and biologist for the Great Barrier, Tiritiri and Mimiwhangata marine conservation projects. One of his most recent missions was working as a photographer on the Greenpeace vessel 'Rainbow Warrior'. 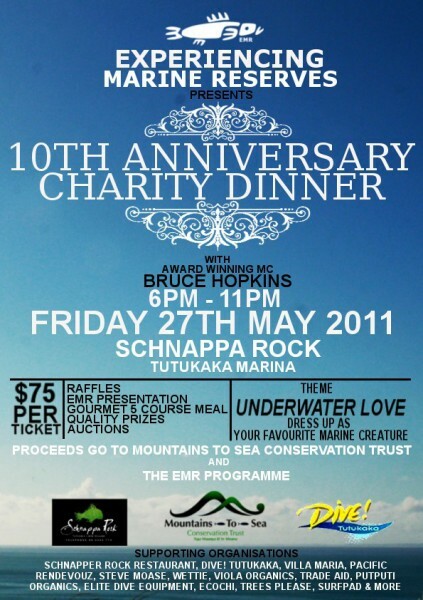 Roger is also a Trustee of the Mountains to Sea Conservation Trust, the organisation that created Marine NZ. Roger received the Queen's Service Medal for public service in 2005. Come and join Dr Grace as he takes you on a photographic journey of his adventures over the past 20 years. A once in a lifetime opportunity to view images by international Greenpeace marine photographer and renowned marine biologist, Dr Roger Grace. The show includes photographs and insights from major international campaigns including Antarctica, set-netting, and a selection of ‘weird and wonderful’ marine life, gathered over a 20 year span. The bar and restaurant at Oceans Resort will be open. Old Library Building, Rust Avenue, Whangarei. Free bags and Seaweek goodies for all participants! Our Oceans in Focus – a photographic insight into the marine world of Greenpeace activist Dr Roger Grace. Toka Tumoana Building, Matthews Ave Kaitaia (opposite RD1). A once in a lifetime opportunity to view a sample of marine images from Dr Grace’s 20 year career photographing high profile international marine campaigns including anti-whaling and Antarctica. Bonus feature. A rare chance to see historical Far North marine images from local photographic archivist Don Hammond’s private collection and the Kaitaia Museum. Cost: Gold coin donation towards Far North Whale Rescue. At 6.30pm the exhibition will be followed by an evening show of images and personal insights by Dr Grace. There will also be a presentation by the Takutaimoana Komiti on the current rahui at Tauroa Point. Free prize draw courtesy of Far North Environment Centre and ITM Mangonui. Houhora Gamefish club (bar and restaurant open). The Exhibition will be open from 6.30 - 8pm. At 8pm the exhibition will be followed by an evening show of images and personal insights by Dr Grace. Restaurant and bar will be open. Experience the wonders of the Whangarei Harbour Marine Reserve. Just turn up and register on the day. Weather permitting – for cancellations go to www.emr.org.nz . Bring your own gear or get free hire for our masks, snorkels, fins and wetsuits. Recommended for everyone 5 years old plus. All children under 15 years must be accompanied by an adult observer. Bring sun block, togs, towel, picnic lunch and a drink. Experienced guides and advanced safety procedures will be in place on the day. Fun for the whole family! Its FREE, but your donation is welcome! Directions: Reotahi Beach, after McLeods Bay follow Reotahi Rd, then Beach Rd to end to Reotahi carpark, opposite Motukaroro Island and Marsden Pt. Diving and dinner to celebrate the 50th anniversary of the club. Bookings essential. Internationally renown marine photographer and biologist Dr Roger Grace will tour the region during Seaweek, using his experiences during two decades with Greenpeace to highlight life below the sea. The roadshow will also feature images from Dr Grace’s work in Northland, providing a local context for the presentations and discussion, says regional co-ordinator Sioux Campbell. A new teacher development workshop based on The End of the Line will also be launched during Seaweek by Whangarei education advisor, Julie Holt. The education for sustainability workshop is being offered to all schools with an interest in marine education and is a first for New Zealand. “Julie is picking up on some excellent generic enquiry learning frameworks and applying these to local situations. A growing number of Northland schools is actively involved in marine conservation and there are always requests for more professional development for teachers in this area,” Mrs Campbell says. A range of other exciting activities throughout the region is offered during Seaweek, including community guided snorkel days at the Whangarei and Goat Island marine reserves, sand sculptures, screenings of Water Whisperers Tangaroa, diving and a primary schools action participation event at One Tree Point School. Seaweek is hosted by the NZ Association for Environmental Education. Its national sponsors in 2011 are the ASB Community Trust, Ministry of Fisheries, Department of Conservation, Greenpeace and the NZ Marine Studies Centre. Seaweek 2011. Feb 26-6 March – The culture, history and traditions of the sea. Back to the future! Kia kaha tangata moana. Editor's note - this is a valuable summary of international work on integrated marine management that I think is worthwhile to pass on to you. Note the article about the tutukaka and Great Barrier Island coasts. The Atlantic Coastal Zone Information Steering Committee (ACZISC) was established in January 1992 to foster cooperation in Atlantic Canada with regards to Integrated Coastal and Ocean Management (ICOM), coastal mapping and geomatics. Networking and disseminating information via meetings and thematic workshops, the Coastal Update e-newsletter and the ACZISC website. Engaging stakeholders in the establishment of COINAtlantic - the Coastal and Ocean Information Network - in support of ICOM in Atlantic Canada. Participating in studies and projects to further our understanding of the coastal zone. The Cooperative Institute for Coastal and Estuarine Environmental Technology (CICEET) fall 2010 progress reports for active projects, and final reports for completed projects, are available at http://ciceet.unh.edu/news/releases/fall10_reports/index.html. 22 November is the deadline for submissions by youth on their vision for the oceans over the next 20 years. The "Oceans 2030: Youth Outlook Contest" is part of the National Council for Science and the Environment Conference (19-21 January 2011, Washington, DC) - http://www.ncseonline.org/conference/Oceans/cms.cfm?id=4031. 31 January is the deadline for submitting abstracts to "People in Places: Engaging Together in Integrated Resource Management", 26-29 June 2011, Halifax, Nova Scotia - http://www.coastalcura.ca/peopleinplaces2011.html. Marxan is free software designed to provide decision support for conservation planning, including the design of reserve systems. To download Marxan and related information, including an update of the Marxan Good Practices Handbook, access http://www.pacmara.org/tikiwiki/tiki-index.php?page=Marxan+Resources+and+Training. 25 February is the deadline for submitting abstracts to the "Coasts and Ports 2011 Conference", 28-30 September 2011, Perth, Western Australia - http://www.coastsandports2011.com.au. 29 November - 1 December 2010: "9th International Conference on Coasts, Ports and Marine Structures", Tehran, Iran - http://icopmas.pmo.ir/en/pages/default.aspx. 8-10 January 2011: "3rd International Conference on Water and Flood Management", Dhaka, Bangladesh - http://www.buet.ac.bd/iwfm/icwfm2011. 7-10 February 2011: "6th International Conference on Remediation of Contaminated Sediments", Louisiana, New Orleans - http://www.battelle.org/conferences/sediments. 9-11 February 2011: "National Conference on Beach Preservation Technology", Jacksonville, Florida - http://www.fsbpa.com/techcall.htm. COASTGIS 2011, the 10th International Symposium on GIS and Computer Cartography for Coastal Zone Management, is scheduled for 5-8 September 2011 in Oostende Belgium. The main theme of CoastGIS 2011 is "Marine and Coastal Spatial Planning". 1 April 2011 is the deadline for abstracts and workshop proposals - http://www.coastgis.info. Seaweek 2011 is coming up fast! Hosted by the NZ Association for Environmental Education, Seaweek is New Zealand's only annual, national celebration of the sea. Dates for next year are 26 February-6 March and the theme is Back to the Future - the culture, history and traditions of the sea. More general information is available at www.seaweek.org.nz (site updates in development). 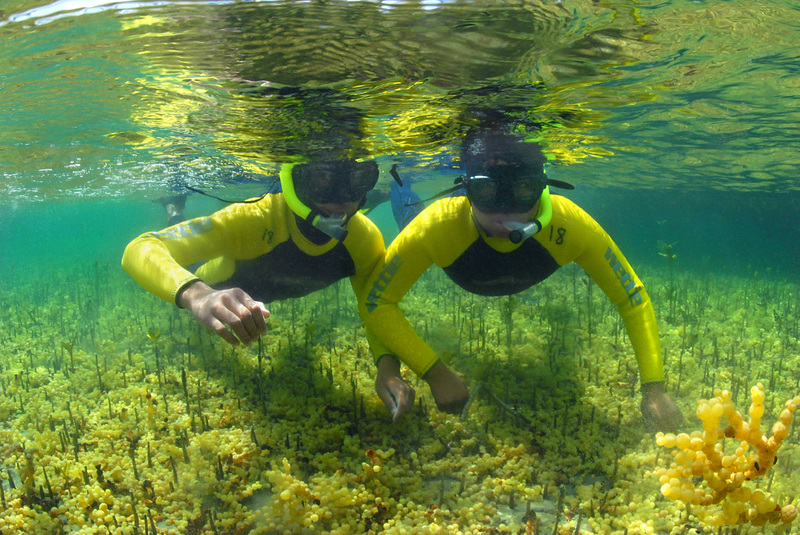 During Seaweek groups, organisations and individuals host events and activities relating to their interests and ideally to the theme for the year. These can be held at a local, regional or even national level - it's over to you. What you do is also totally up to you - it could be a competition or new product/resource launch, a movie, free day at your site, discounted trips, snorkel day, swim, guided walk - you can check out all the events that were run in 2010 for ideas. There is support with promotion and publicity through the Seaweek marketing effort and other resources may also be available. Northland is a fantastic region to celebrate Seaweek in! This is a great opportunity for people to showcase what they do and care about during the best of the summer. Please pass this message on to your networks and friends. Kaimatanga Hapori-Hononga/Senior Community Relations Officer, Conservation Awareness, Tai Tokerau. Days of work Monday, Wednesday, Thursday. I (vince) am developing a Northland Marine Protection Newsletter and blog to help with the information flow. If you are not subscribed please do. It is painless. If you want to post news to this system (circulation 300 + and growing) email me. If you know people you would like to invite to signup to this newsletter, please send them the following link. 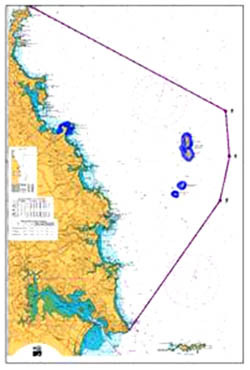 http://www.marinereserve.co.nz <http://www.marinereserve.co.nz/> Home of Bay of Islands Maritime Park Inc.
http://www.kaiparaharbour.net.nz <http://www.kaiparaharbour.net.nz/> Home of the Integrated Kaipara Harbour Management Group (IKHMG) - an initiative developed by Te Uri o Hau and its stakeholders to assist in managing the Kaipara Harbour. In future news updates we will attempt to keep you informed with what is happening with marine protection groups in Northland. Here’s a first, more to come. “A marine park covering much of the Whangarei District's coast could generate $22 million a year for Northland, the proposal's backers say. The park would see commercial fishing banned in an 1800sq km triangle between Whangarei Heads, Cape Brett and the Poor Knights Islands. 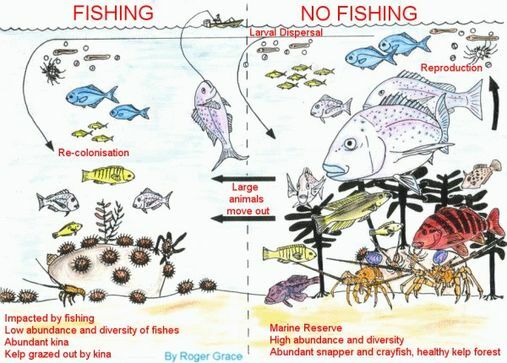 Recreational fishing would still be allowed, albeit with reduced bag limits, except in a few protected areas. The Marine National Park proposal has been around at least since 2005. It has won the backing of environmental groups and the Northland Chamber of Commerce, but is strongly opposed by commercial fishers. Now two of its backers, Dive Tutukaka owner Jeroen Jongejans and Tutukaka investor John Dentice, are hoping to bring the region's environmental watchdog, the Northland Regional Council, on board. In a presentation to councillors last week the pair said axing commercial fishing in the 1800sq km area would cost the region $250,000 in lost income. However, that would be easily outweighed by $22 million in economic benefits through tourism and recreational fishing. The benefit to Tutukaka alone would be around $7 million. Currently tourism in Tutukaka, including Mr Jongejans' own dive business, employs more than 60 people, while commercial fishing employs four. In all of Northland tourism employed one in every 10 workers, whereas commercial fishing employed 290 in total. Mr Jongejans said they were not pushing for a marine reserve or a marine protected area, but for a marine national park which catered for recreational fishing and customary rights. The aim was to increase fish stocks and enhance habitats, as well as to boost economic returns for the region. They suggested cutting daily bag limits for fish and shellfish by half inside the park. Asked by councillors what he wanted from them, Mr Jongejans said: "We'd love to have your endorsement. From a tourism point of view, and an economic point of view, it's a no-brainer," he added. Cr Craig Brown asked whether the proposed bag limit was negotiable, and why they wanted a marine park at Tutukaka and not, for example, in the Kaipara where most of Northland's snapper were spawned. "Some people would say it's because you're not running a business in the Kaipara," Mr Brown said. If you know people you would like to invite to signup to this newsletter, please send them the following link. You can also unsubscribe at this link. This Newsletter and blog service aims to provide an easy to use format of regular contact with you about what is happening in marine protection and management in Northland. You have previously been on one of our marine information contact lists. We are currently updating this list to assure we have correct contact details. We have created an electronic database/newsletter system which can send you news updates via email as well as post on a web blog site. At any time you can easily opt out of the newsletter system. Your subscriber information will remain secure and will not be shared with third parties. The MPA Northland Newsletter will inform you of new information publications, research, monitoring reports and news about marine protection proposals and processes here in Northland. We are aiming to put out a number of information updates throughout the year. Communities around Northland are interested in marine protection. Current projects underway with iwi/hapu and community based groups are expanding their activity and capacity all the time. This community based approach to marine management shows great promise as a way to address issues standing in the way of effective management and conservation. Department staff will be actively supporting local initiatives around marine protection in the coming year. If you want to know more about what is happening in your local area you can contact your local DOC Area office or Vince Kerr or Paul Buisson at the Conservancy office in Whangarei. Our technical team in the Conservancy office have just released some significant reports and resources which we would like to share with you here. 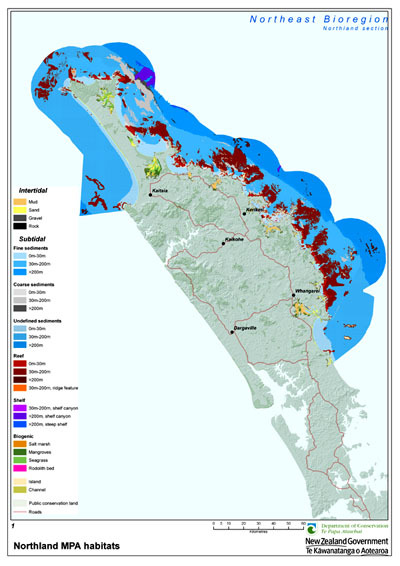 A marine habitat map has been completed for the area of coast out to the 12mile boundary from Mangawhai to Ahipara (version 1). The map book, the technical report and a poster are now available online from the DOC website. Over the coming months GIS mapping resources created by this project will be handed over and presented to interested community groups, iwi and hapu. In the next stages of this project information layers will be developed that focus on the values of our marine environment and how we currently use the marine environment. This information should be valuable to any group in Northland looking at marine protection and management. 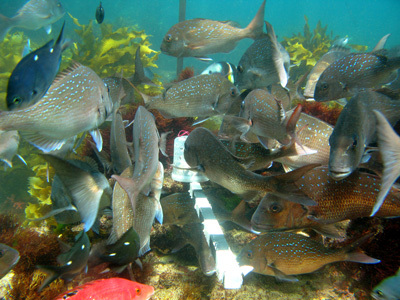 Our reef fish monitoring program was extended to Cape Karikari and North Cape last summer (2009) building on the existing long term data sets at Poor Knights Islands, Mimiwhangata and Cape Brett. This information is one of the best ways to we have of observing the changes that are occurring to our shallow reefs due to heavy local fishing pressure. This concern for our fished shallow reef systems is in stark contrast to the restoration of fish stocks that we are observing in our marine reserves. The latest report can be downloaded from the DOC web site. That’s a brief look at some of the marine work our DOC team are involved in. We look forward to working with you to protect and restore our precious Northland marine environment.